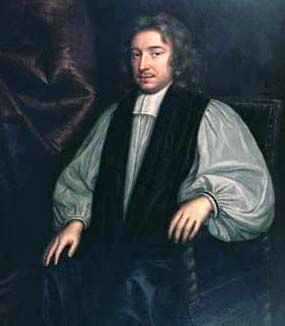 John Wilkins, Bishop of Chester was born in Fawsley, Northamptonshire. He became Vicar of Fawsley in 1637 and afterwards acted as Chaplain to Lord Saye and Sele, Lord Berkeley and Prince Charles Louis, nephew of Charles I and afterwards, in exile, elector palatine of the Rhine. He was educated at Magdalen, Oxford and in 1648 he became warden of Wadham College. In 1659 he was appointed as Master of Trinity College, Cambridge by Richard Cromwell. In 1668 he became Bishop of Chester. A champion of science, he expounded the discoveries and theories of Copernicus, Galileo and Kepler. He was a founder and first Secretary of the Royal Society. He died in 1672 in London.